1/4 Accoyo, 8x Champ, Fiber Industry Award for Fleece! Sienna is a proven excellent Mother and easy birther. She's given us two beautiful female crias with IgG's of 2,000 and 3,000 respectively, followed by a beautiful bay black Snowmass Midnight Magic Son and now a beautiful dark fawn Victor's Hemi-Accoyo Renegade son. 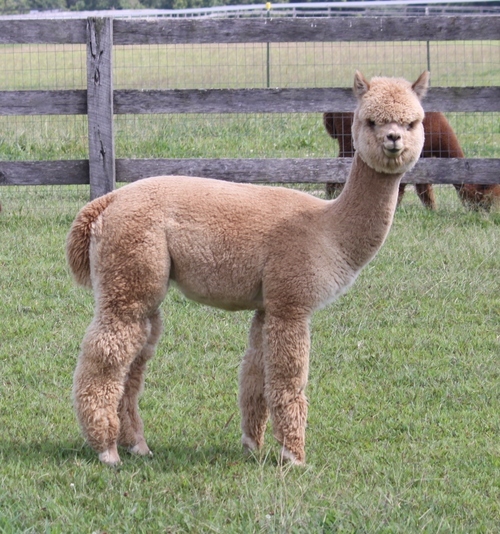 She is the daughter of Bay Black champion male Sunburst London, son of the famed 4Peruvian Black Magic, and Sienna's Maternal Grandsire is the well known Peruvian Gold Rush G180. Her fleece was 22.6 microns at 5 years of age, and each of her offspring have her correct conformation and fine fleece, each being an improvement over their Mother. We hate to part with this great production female but since both of her daughters are producing outstanding crias for us we will be willing to do so. Purchase her bred to Accoyo America Enterprise (bred on 6/26/10) for $4,900 or with her stunning Victor's Hemi-Accoyo Renegade son at side and bred to Accoyo America Enterprise for a 3-in-1 package for $7,500(if purchased without cria at side we will provide free board at our farm until cria weaned approx end of December). Mocha is a lovely, compact girl with great staple length, and has produced one fantastic offspring after the other. 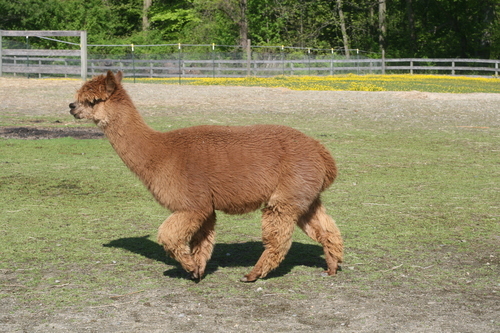 Mocha's April 2010 cria is a beautiful medium fawn female by champion herdsire Irish Cream whom we recently purchased (June 2011). We liked the results of that pairing so much we rebred Mocha to Irish Cream for an October 2012 delivery resulting in another gorgeous girl, this time light brown like her dam. Mocha's first cria born Nov. '08 is a medium fawn Snowmass Invincible son whose first offspring have hit the ground this Fall (2012). He is CrimpHaven's Invincible's Maxximus, a beautiful macho male with tons of fine, bright and crimpy fleece with AMAZING Staple length. (2010 histogram for Maxximus: AFD 17.8, SD 3.5, CV 19.9, %>30 0.7, prime blanket in 2011 and 2012 weighed about 7 lbs and very excellent neck fiber 2 lbs). Maxx won 1st, 2nd and 3rd place ribbons by the age of 17 months and mostly as youngest or near youngest in the class. 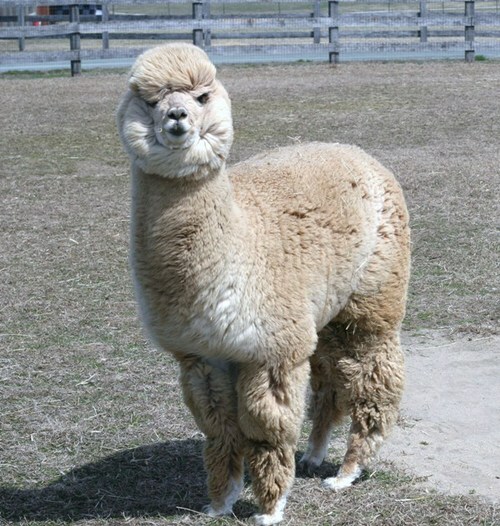 His fleece entries at VAOBA 2011 and North Carolina show in early 2012 both won the blue ribbon! Along with other notable ancestors, Mocha carries the blood of true black Peruvian Black Magic on her dam's side and Victor on her Dad's. Her background is loaded with color! 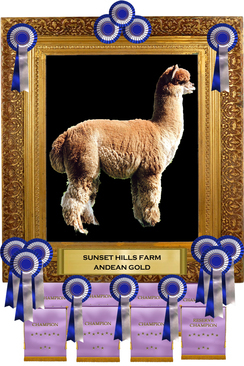 Her sire, Sunset Hills Andean Gold, won the AFCNA Spirit of Fiber award at age 4 and has achieved many (8, I believe) championships in addition to Get of Sire. Mocha and her offspring have Andean Gold's fineness of fleece and long staple length with a low percentage of guard hairs. Her 4/18/11 prime blanket weighed in at 6.5 lbs. 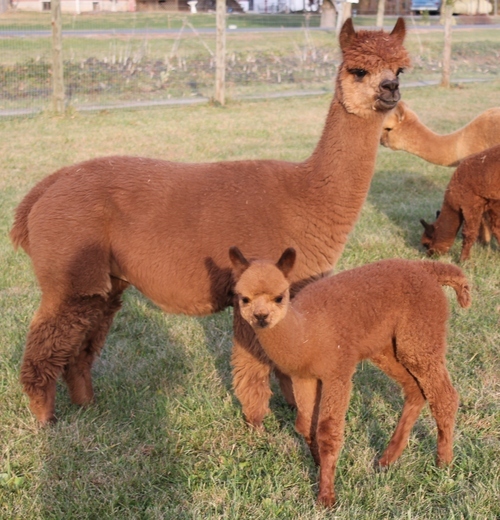 Mocha is a great Mom with four unassisted births and ribbon-winning quality crias to her credit.